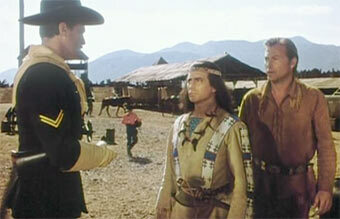 Old Shatterhand arrives just in time to save Tujunga, Winnetou's adopted son, from some villains. He meets Paloma Nakana, a halfbreed who lives in the wilderness like a hermit. With her is Tom, whose parents had been killed by white bandits and Comanches and who now is an important witness. On his way to Golden Hill indians attack a wagon trek pretending they were Apaches but Old Shatterhand recognizes the truth: Comanches faked the traces. 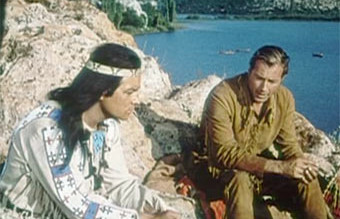 White gangsters try to prevent a peace treaty between the army and the Apaches so they can appropriate fertile land. 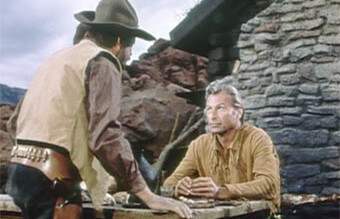 Old Shatterhand tries to find the gangsters and encounters his blood brother Winnetou. 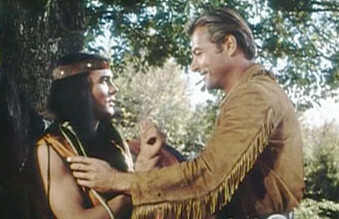 Together they go to the Comanches and Winnetou challenges their chief for a duel. 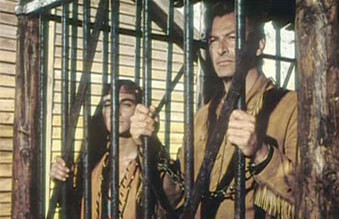 Tujunga tries to rescue Paloma from some soldiers molesting her but is captured and taken to the fort's jail. Old Shatterhand trying to free Tujunga is captured, too, by perfidious Captain Bradley.